No other pad protects your produce like the original Jiffy macerated produce pad! 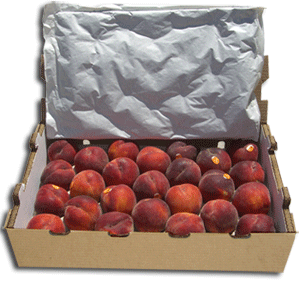 Jiffy's thick cushion of macerated paper expands in transit to create a pocket of safety from the shocks and vibrations that can bruise your produce and damage your investment. A Jiffy Pad is the only piece of protective packaging that gets better as you use it! Don't forget Jiffy Pads are 100% Recyclable! Thicknesses available: 8,10,12 and 14 series. Paper Types: A: Brown on Brown, B: White on Brown, C: White on White. Custom sizes & thicknesses are available. SIMS: Automatic Jiffy Produce Pad inserter are available. The 1st number represents the pad thickness; 8,10,12 & 14 (the higher the # the thicker the pad). The last 2 numbers represent the size of the pad in inches.